The lids are the trays, mine is the the one with the mug which is filled with pumpkin egg nog (DH won’t drink any form of egg nog). 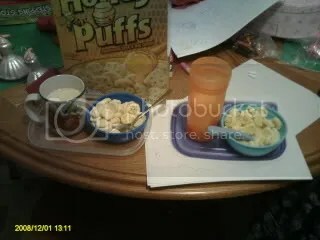 DH’s is the one on the blue ‘tray’ his cup (actually a sippy cup with no lid) has milk and he has a baby fork (yes, fork) to eat his cereal with. It was so cute and thoughtful. I told our 7 year old (who will be 8 in February) that we will work on me teaching her to cook this year and also on how to work the coffee maker so they can make something else next year – she is very excited with this prospect. We celebrated early with my brother and Sister in Love December 23rd as we weren’t sure if we’d see them on Christmas Day. 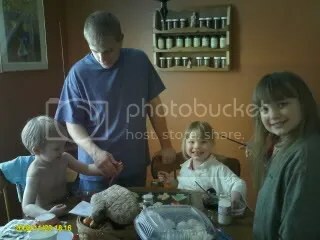 The littles participated in helping make cookies, opened some presents and just enjoyed being with their Aunt and Uncle. 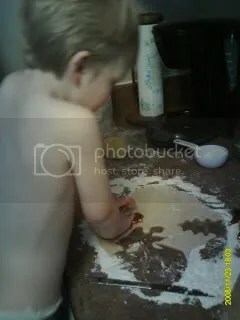 I will say now that Christian does have his t-shirt off since they were using food coloring to ‘paint’ the cookies. Bethanne is stirring and Christian is chopping nuts. 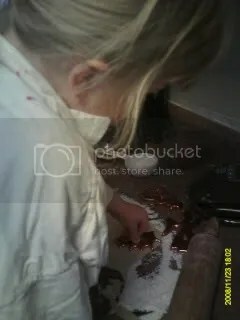 Cookie decorating with Uncle supervising (sort of LOL) I think more sprinkles and food coloring went into bellies than on the cookies. So this was our time with Christmas with my brother and his wonderful wife (someone wonderful had to marry it him, it definitely took someone special LOL) I hope enjoyed the pictures. 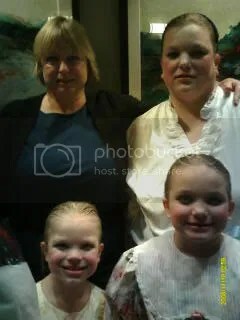 The girls and I were in the local production of The Nutcracker though Ohio Performing Arts Institute, it was also the 20th Anniversary for this production! 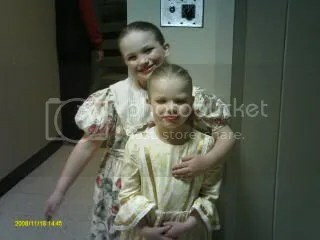 This was Hannah’s 3rd year and Bethanne’s and I’s first year. It was a lot of fun and a lot of work – I almost wished we had another performance or two to make it worth all the rehearsal time. 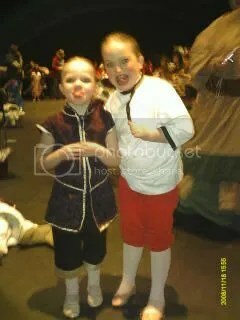 We had two performances on Friday (a matinee for local school children and a night performance) and a Saturday night performance. 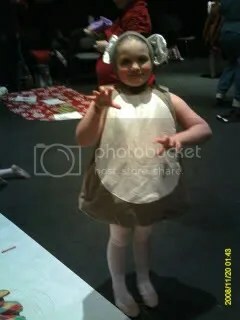 My brother also performed – it was his 1st year. 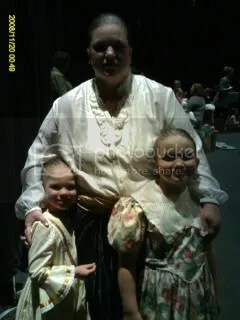 Here are some pictures from our time back stage and also greeting my mom. The girls and I in our party scene dresses (sorry about the darkness, the dressing room is quite dark) I just love the dress Bethanne is in – I’d love to make two of these for the girls for 2010’s production. The girls in their Children of the Nations costumes. I would have preferred a dress but they got stuck being Russians and had to wear pants. My question is, Russian women never wear dresses? Oh well, they still made the cutest Russians 🙂 minus the weird faces they are making. 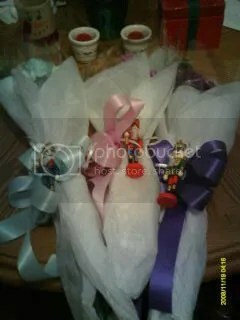 After the show we are allowed to go mingle with the audience my mom came to Friday’s show and gave us beautiful flowers (mine were blue, Hannah’s dark purple and Bethanne’s light purple) all with an attached Nutcracker ornament. 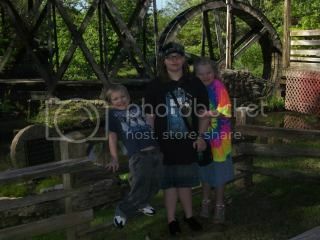 The other picture is the girls and I with my mom. My husband and Christian also came but well they didn’t make it through the entire show. My inlaws came to Saturday’s performance they gave each of us a very nice, full sized, Nutcracker. Mine included a music box playing We Wish You A Merry Christmas. I forgot to take pictures before we put them in the attic with the rest of the Christmas decorations. It was a wonderful time and I thoroughly enjoyed the time the girls and I had together. Christian wants to try out next year and that may be a definite possibility. One of these days I’d love to have our entire in it with my husband being my dance partner in the Party Scene. Oh my dance partner this year was a young man of high school age and he made a very nice ornament for me that he gave me after our last performance. Eighteen-year-old Astrid Bjorklund has been studying medicine under Dr. Elizabeth Bjorklund’s direction and dreams of joining her practice in Blessing. But when a missionary arrives and tells of the need for medical ministry in Africa, he seems to look directly at her. Could God be calling her to go to Africa? Joshua Landsverk left Blessing two years ago, but he’s never forgotten Astrid. Returning to town he seeks to court her, and love begins to bloom. When the opportunity opens for Astrid to go to Chicago for further training, she finds it difficult to leave home•and Joshua. They agree to correspond, but after receiving only one letter from him, she learns he’s left town–again. Believing Joshua no longer loves her, Astrid makes an impetuous, heart-wrenching decision. Will she regret the choice she’s made? 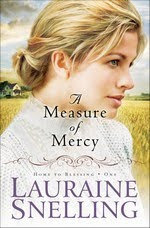 If you are looking for a book that is inspirational and you won’t be embarassed to be seen reading it then “A Measure of Mercy” is that book. Lauraine Snelling has done another great job is weaving a intriguing story with 3 dimensional characters that draw you in and wrap you in their story. I was pulled into the story as soon as it began, I felt like I was living in the township of Blessing and invited into the character’s life. I could feel the emotion that the doctor’s felt when they lost a patient and a baby during child birth. Even though there is a romance weaved into the storyline there is no kissing or hugging or anything untoward in the story that would deter me from letting a young lady read this. Lauraine Snelling has another wonderful on the market one that I would not be afraid to suggest to a friend, married or unmarried. The wonderful thing about this book is how much the character rely and lean on God for His provisions, even when a character has a crisis of Faith she still turns to God for His knowledge and guidance in her life. **I was provided a copy of this book from Bethany House Publishers in exchange for my honest review. When everyday concerns and problems linger–when desires of our heart go unmet–it’s easy to wonder if we’ve done something wrong or if God cares. Leslie Haskin is no stranger to these feelings, but through adversity she has emerged victorious. “This book is honest and straightforward. It is about real life for real people,” Leslie says. “Whether the struggle is emotional, spiritual, or physical, I write for those who, like me, would like some answers but even more need a revival of spirit. There are times when we all think that God has forgotten us and we wonder does He hear our prayers and needs? Of course this also makes our faith stronger in the end when we realize, yes, He does care and He answers us in His way. It is hard to keep that in mind though when trials come our way, it may be a sick child or it could be something major – like a bank foreclosing on the house. Leslie Haskin’s has written a book for all of us who need reassurance that God is present and He is listening and wants to comfort us. Leslie Haskin escaped one of the towers at the World Trade Center on September 11, 2001 and she knows what the lowest of lows can be like, today she is active in mission work. She has founded Safe HUGS which is a ministry that helps women and children. 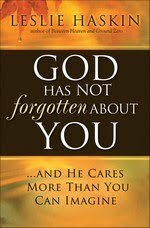 “God Has Not Forgotten About You” is a book that can speak to the emotional, spiritual and physical parts of our beings that need God so much. There are words to savor in this book and it is a book that takes some time to read as the words are digested and weighed against God’s Word. Thankfully this book is Scripturally based, or at least I found it to be and that is what counts for me – there are not enough platitudes that anyone can write to comfort me unless it’s based on God’s Word. **This book was provided to me by Bethany House Publishers for my honest review. ***This book can be purchased at Bethany House Publishers website. “Stories From Japan: Past to Present” by Al Hammond is a wonderful book for those whose hearts are called to missions or want to experience mission work from a first hand account. I am both of these, I yearn to do mission work and right now the mission is my home but my heart aches for those in countries who are persecuted for being Christian or who don’t even know the Lord. Mr. Hammond has a knack for writing about the Japanese culture from a missionary’s viewpoint and makes the reader feel as if they know the people he ministers to and almost like they are there with him and his family. For sixteen years Al Hammond and his family served as missionaries to Japan planting churches and editing an open forum magazine. With much love, which comes through his writing, the reader will enjoy Mr. Hammond’s book about the Japanese people. “Stories from Japan” covers invitation, adjustments, rejection, communication, bonding, student encounters, women, mission strategies, readjustment to America, demon encounters and many more in it’s forty chapters. Throughout the entire book one feels like they are with the Hammonds through all the trials of mission work and can feel the love and sometimes even a level of frustration (isn’t it frustrating when you’re not sure of cultural norms?). I felt like I was observing from an outsider looking in when I read this book. Even though it is a long read, it is so worth it! It is an edifying read of how Christians can reach out and minister to others with sacrifice and not want anything in return. I do recommend Mr. Hammond’s book to others who desire to learn more about missionaries and try to understand what goes on in a missionary’s life. **I was given a copy of this book by Mr. Al Hammond through Believer’s Press in exchange for my honest review. ***This book can be purchased through Amazon or through Believer’s Press Marketplace. “The Fallacy Detective” by Nathaniel and Hans Bluedorn is a book that should be on every homeschooling family’s book shelves (and even those who don’t homeschool) especially if they enjoy Classical home educating. 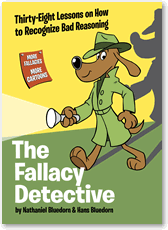 “The Fallacy Detective” is geared for ages 12 to adult but could easily be used for those under the age of twelve – in fact I plan on using it in our upcoming 2010-2011 school year for my will be 8 and 6 year olds. The book covers thirty eight lessons on recognizing logic that is skewed. Each fallacy is full defined and explained and cartoons are through out the book from Calvin and Hobbes, Peanuts and Dilbert which aid in understanding. The cartoons are child safe for the most part however I did see one with Calvin being punched and a lawyer holding a gun as evidence, these are use only as teaching tools and could allow a parent to expound why violence isn’t needed by Christians. Each chapter is fairly short, I read each in 5 minutes or less with following exercises that the student or adult can do to train themselves to recognize bad reasoning. Some of the fallacies that are discussed in “The Fallacy Detective” are: red herrings, ad hominem, circular reasoning, part-to-whole, post hoc ergo propter hoc, propaganda, transfer and many, many more. Again each fallacy has a set of exercises after the short reading assignment, and it is recommended that the exercises be done in a group of two or more so that they can be discussed and see other points of view. 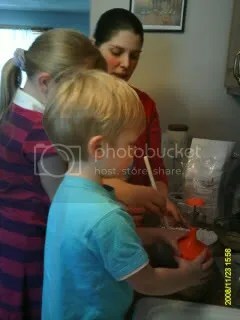 This works well in a homeschool family since moms and dads can each participate with the children. All answers for the exercises are given in the back of the book, also is the Fallacy Detective game with all rules, how to score, preparation given. This book is a great resource for anyone wanting to uncover fallacies in all walks of life, from reading a book, to discussions and T.V. commericals. You can sign up for The Fallacy Detective News and get “The Fallacy Detective” test, both for free. The book sells for $22.00 and can be purchased at Amazon, Christianbook, Rainbow Resource and Trivium Pursuit. So as fellow homeschoolers look towards next year’s curriculum I would recommend this book as a must-have. **I received this book from Trivium Pursuit in exchange for my honest review. 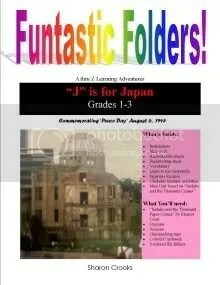 I so enjoy adding new elements to our homeschooling lessons and having the chance to use and review Sharon Crooks, "J is For Japan" Funtastic Folder is no different. I have come to really enjoy Sharon Crooks unit studies/file folder books. 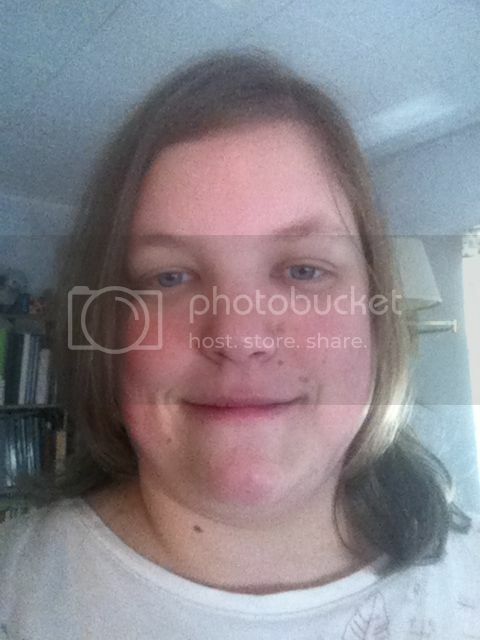 She provides all the research and printables needed as well as hypertext links for further research on the subject. For "J is For Japan" there is both a Preschool and an Elementary level (Grades 1 -3), but the elementary level could be used for a younger student as well. During this study you will study Japan and the date that will live on for Japenese – August 6, 1945 as well as a young girl named Sadako. There are handwriting sheets as well as excercises like learning to use chopsticks, counting in Japenese and even authentic Japenese cuisine. 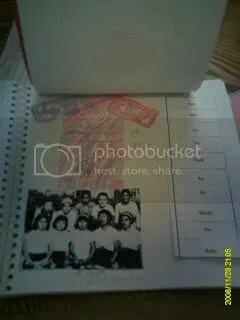 My daughter really enjoyed learning words for Japenese numbers and did very well on recalling them – which I attribute to the lapbook we did along with the unit. Lapbooks really do work wonders in the retaining and recalling of information the student learns. 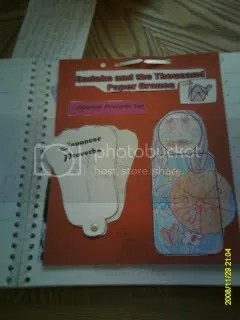 Everything you need is included in this lesson except for a few minor supplies such as file folder (we used a spiral bounded books), card stock, brads, scissors, glue, crayons and the book "Sadako and the Thousand Paper Cranes" by Eleanor Coerr. In place of the brads we used the metal clips sold in office supply stores in order to add the extra sheets. The book can be obtained easily by visiting a library or buying your own. The book does deal with death and also Japenese customs surrounding death and they are not Christians in the book – thankfully Sharon Crooks warned me of this prior to starting the unit and I was prepared to answer my daughter’s questions. This unit was very well done and my daughter was able to do most of it on her own, which made time for me to teach my other daughter. She enjoyed learning the culture – although we couldn’t do any of the recipes we did do the activities that we were able to and I think that made for an even richer learning experience. 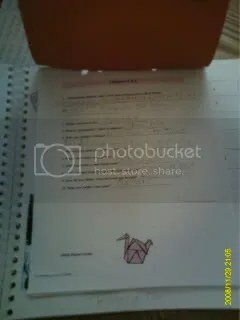 This unit study can be found at CurrClick. 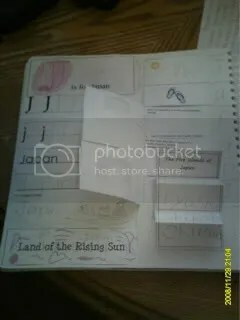 **I was provided a copy of "J is for Japan" unit study by Sharon Crooks in exchange for my honest review. I have one son and my prayer is that he will become a godly man who wants to serve the Lord and raise a family who serves God. When I was given the chance to review “Raising Real Men” by Hal and Melanie Young I jumped on the chance to read the book. The book’s subtitle is “Surviving, Teaching and Appreciating Boys” , and at this moment in my life with a 3 year old boy at home surviving his antics is a goal of mine! I also have moments of wondering can I actually homeschool an active and inquisitive little boy without destroying his eventual manliness. Hal and Melanie Young are the parents of 6 boys and two girls, and have a lot of experience of raising and home educating boys. There advice is down to earth and almost feels like you chatting with them over a cup of coffee (or tea if you prefer that). Even if the Lord decides only to give me one little boy, this book will be a handy guide on what I can do to help him become a man of God without making him effeminate like the world would want him to be. One of the chapters even goes into resisting the feminization of boys – which is so timely in today’s world that wants girls to act like boys and boys to act like girls. Scriptural to the hilt, using God’s Word really drives home the advice that the Young’s give from their real world experiences of raising six young men. Discussing items of interest such as hereos (no Spiderman) that are appropriate for our boys to look up to, how boys can be boys without sacrificing our or their Faith. One thing that I’ve been struggling with is wether or not to let my son use fake swords and/or guns and while I am still on the fence about guns as long as he knows the rules (no hitting animals, sisters, etc) I would allow fake sword play. There can be a time for this type of play – especially if he is defending his sisters and not killing anyone. While I may not agree with everything that the Young’s wrote in this book, I can’t recall a specific item, this book is very sound in using Scripture to back up their beliefs and experiences in raising young men to be men of God. The Youngs have a great book and a wonderful resource for Christian parents who choose to utilize it and I do recommend this to anyone mom or dad who has one son or many becasue regardless on how many sons a family may have we want them all to be Godly men when they grow up. 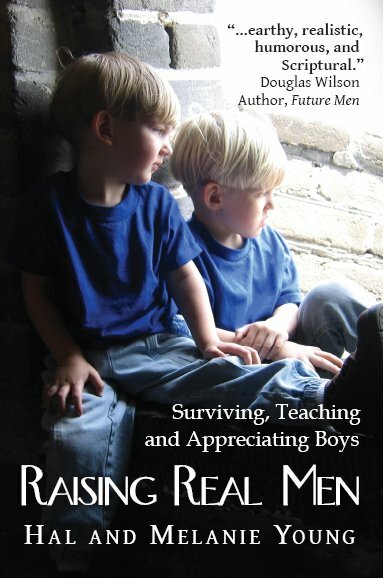 * I was provided a copy of “Raising Real Men” by Hal and Melanie Young for my honest review. ** The book can be pre-ordered now by visiting Raising Real Men pre-orders. *** The book is $15.00 and there is also an ebook option and a study guide available for purchase. For some reason Australia holds a lot of fascination for children, maybe it’s the cute koala’s or the kangaroo’s, but something draws the attention of children to Australia. Wouldn’t it be fun to take a trip to see and learn all about Australia? You bet! Of course, if you’re like my family, a trip to Australia isn’t in the budget so how about the next closet thing…….an Amanda Bennett unit study in the form of a new addition to the Download and Go series from The Old Schoolhouse? Day 1: Where on Earth is Australia? Day 2: Some of the Special Places in Australia? Day 3: A Bit of History. Day 4: Cool Things to know about Australia. Day 5: Fun and Games in Australia. Again, the teacher/parent can extend the study if the scholars are proving to stay interested in studying this country. So if you’d like to extend to a two week study go ahead – by easily adjusting what activities you do each day can easily extend the time you spend studying Australia. Included with this study are links for videos, you, the parent/teacher don’t have to do any renting or hunting! Click on the hyper text link and there you go, an educational video on demand. The books list is also included for each day so check your library, reserve and pick up for easy prep – no wondering if you’ve found an okay book – the research has been done for you. Along with the wonderful unit study, there is also an included lapbook. Lapbooks are great for retaining information and a wonderful way of documenting work completed through the year. Included cards and a pocket for vocabulary words learned through the week, continent mini book, mini-translator (find out what certain words mean Down Under), and several other mini books will create a wonderful lapbook. Don’t worry, if you’ve never lapbooked before or it’s been awhile there is a short ‘refresher’ at the begining of the unit. I suggest this study, wether you’re looking for something fun and easy to take a break from ‘regular’ school or you want to add to your other studies for your students then this is a wonderful way to do so. Inexpensively priced, instantly available, and reusable make it very economical no matter how small or larger your family is. With all the planning done for you why not try it? **I received a copy of this e-book from The Old Schoolhouse in exchange for my honest review. 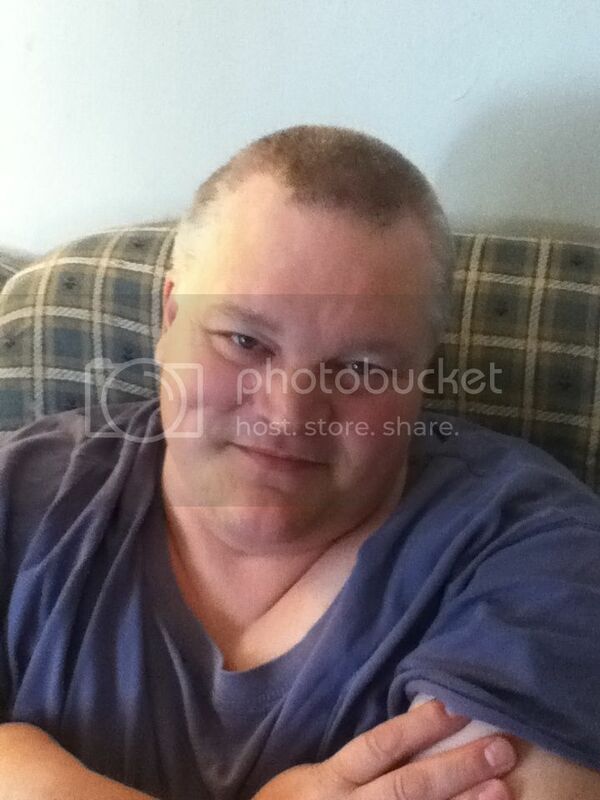 To view my full disclosure see my side bar.